In the summer of 1942, the Japanese Combined Fleet sought a decisive battle with the U.S. Pacific Fleet to put the Americans out of action. Admiral Yamamoto chose Midway Island, at the far eastern end of the Hawaiian chain, as a target for which the Americans would fight. The Americans indeed came to fight, sinking all four of Yamamoto’s fleet carriers for the loss of one of their own. 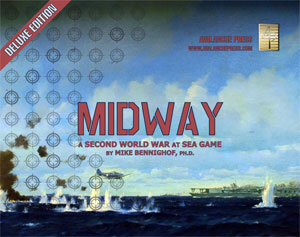 Midway Deluxe Edition is a completely new edition of our old Midway game, featuring not only the climactic Battle of Midway but also the attempted relief of Wake Island, the Japanese attack on Pearl Harbor, Japanese plans for the invasion of Hawai’i, earlier Japanese plans to attack Pearl Harbor and much more. Midway Deluxe Edition includes 700 playing pieces: 280 “long” ship pieces and 420 square ones representing aircraft, smaller ships and markers needed for play. There are two operational maps forming a 42x28-inch playing area covering the Hawai’ian islands, Midway and surrounding waters. Like its sister game South Pacific, Midway Deluxe Edition includes not only the standard, generic Tactical Map but also a special Tactical Map, this time showing Pearl Harbor with all of the locations of American warships on the fateful morning of December 7th, 1941. There are over 50 scenarios, organized in our popular “story arc” format that weaves the narrative of the campaign into the scenarios, allowing them to tell the story of these pivotal battles.